The title Running Through Walls certainly captures many aspects of former Republic of Ireland football international, David Langan's life. 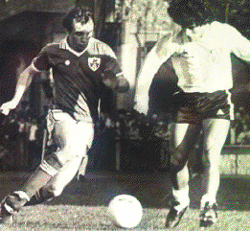 Langan was the type of footballer that Irish fans have always loved. He was swashbuckling fullback that gave no quarter nor asked for any. His performances on the pitch were always wholeheartedly committed, particularly when playing in the green of Ireland. His fierce tackling and marauding runs down the wing made him a crowd-favourite with both club and country. Those of us who saw him play could never forget Dave Langan. His international career was cruelly ended by Jack Charlton right on the cusp of Ireland's first participation in a major football final competition - Euro 88. With all of the hype and excitement that surrounded the Charlton era most of us were guilty of not being aware, or perhaps not even caring, that there were casualties left in the wake of of those heady days. Dave Langan is perhaps the most tragic example of those casualties. Running Through Walls is a well-written account of a remarkable story about a true Irish sporting hero. Dave Langan made his English club debut in February 1977 for Derby County in the old First Division (now the Premiership). His last club appearance was as a substitute for Peterborough United in May 1989 (although he ended up being substituted also - the first time in the club's history that a sub had been subbed). Between those dates he won 26 caps for the Republic of Ireland. This was in an era when European and World Cup qualifying groups could have as few as three or four teams. And of course Ireland did not qualify for any major finals so the opportunity to amass more caps simply didn't exist. Also his international caps tally would certainly have been higher except for injuries. In fact Langan's chronic injury problems can be traced directly to a damaged cartilage that he sustained in 1981 while playing for Ireland. He was injured in an historic 3-2 victory at Lansdowne Road (now Aviva Stadium) over a fantastic French team, including the great Michel Platini, in a 1982 World Cup qualifier. The rehab from this injury also led to him cracking a vertebra. Although Langan managed to continue playing professional football he was constantly in pain, and much like the great Paul McGrath after him, he could not train properly. "Even now it still hurts although I am not as angry about it now as I was back then. I think what makes it worse was when I did meet up with him [Jack Charlton], he told me he did not have my number and that was why he never told me [that Langan had not made the Euro 88 squad]. For me it was a disappointing way to be treated by someone who was and still is a hero to the Irish people, I just wish he could have been more honest and open with me. 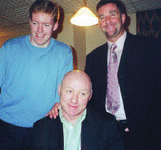 In his book Jack wrote that he thought I had been an excellent fullback, which was good to hear although it made my exclusion harder. He also said that he had not seen me for months before he bumped into me at a friendly game with Poland before they headed off to the Euros .... he says I was drunk and trying to aggravate him. That made me feel worse about the whole thing, I am not sure why Jack felt the need to say that maybe he wanted to vindicate his decision to leave me out of the squad .... I can tell you that nothing is further from the truth, I was not drunk that day and I was not one bit aggressive with Jack even though and many will agree I did deserve some form of explanation for being dropped. To add injury to insult the FAI refused to grant Langan permission for a testimonial. Previously, 25 caps was enough to be granted a Testimonial but the FAI increased it to 50 as the break-up of the Soviet Union and other nations had led to an increasing number of international matches. Langan won 26 caps for his country but the conditions were changed when Dave had attained 25. Running Through Walls is much more than a sporting tale as it tells the story of Langan's life after football including his broken marriages, drinking and gambling problems, working in a dry cleaners, as a milkman, for Peterborough Town Council, ending up homeless and sleeping in the basement of the town hall, and much more. Most of the chapters in the book are supplemented by third party accounts of particular aspects of Langan's football career and life. There are interesting and contextualising contributions from Irish journalist Vincent Hogan, former football colleagues including Irish internationals Niall Quinn and Ray Houghton, club team mates, and from friends and family. I remember Dave telling me that Jack told him he didnt understand how he had gotten so many caps, I dont understand what he had against Dave but Ill never forgive him for the way he treated him, he broke his heart. 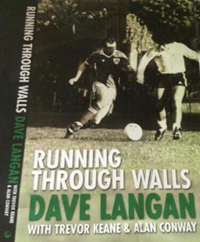 Dave Langan : Running Through Walls is a poignant and in many ways an intriguing read. It is much more than the life story of a footballer. The book is a warts-and-all account about a true Irish hero who has inspired people both on an off the football pitch. The book conveys the image of a man that deals with life with an honesty that was the hallmark of his performances on the pitch. Running Through Walls is definitely recommended for Irish football fans of all generations, even those that may never have heard of Dave Langan. Importantly it is also a hugely interesting story of a man's life and whether you are interested in football, or not, get your hands on a copy.